USB/FLASH READER/MP3 COMPATIBILITY - Connect your external USB, computer PC, flash drive or Bluetooth device to mix & record. Use the built-in controls to play/pause, skip tracks and switch between modes. 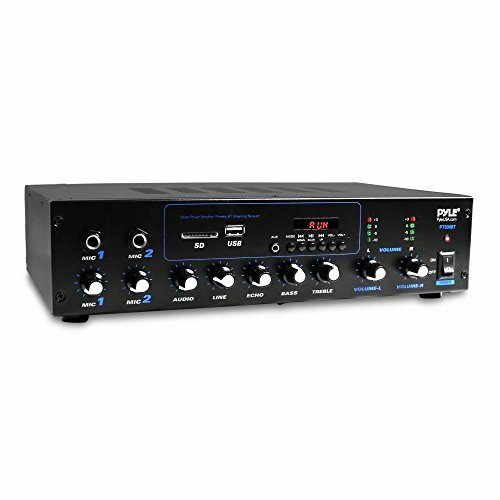 MIC AND STEREO LINE INPUTS - Supporting XLR and unbalanced 1/4" Plug with +48V Phantom button, highly accurate LED Peak Level Indicator and Ultra-musical 3-band EQ on all channels. Ultra-low noise, high headroom mixer with super easy functionality. RUGGED STEEL CHASSIS - With sealed rotary controls to resist dust and grime, this compact DJ Mixer will provide total dynamic control. This incredibly versatile mixer is great for high quality on stage performance, live gigs and Karaoke. NEW MULTI-VOLTAGE POWER SUPPLY - 100V-240V (+/-15V DC power adapter) ideal for worldwide usage. Enjoy a value packed mixing solution today with performances that sound great each time.